When Sang* became a Christian, his neighbor cut down his corn field. The police didn’t come to his aid because they didn’t support his faith either. It was the pastor of his church that looked out for his family and helped him try to replant his field. Pastors in Laos deal with persecution each day, and many have been jailed for a time. They are also bi-vocational which means they are farmers, as well as pastors, to provide for their families. Below: Laotian pastors gather closely to ECHO farm manager Sombat as he teaches a seminar on grafting. Above: Sombat demonstrates an improved cookstove. During the session on banana stalk silage, the pastors learned how to finely chop banana stalks, mix with molasses and sugar and let the fermentation process produce a nutritious feed supplement for pigs. The pastors commented that they used to boil the banana stalks for 2-3 hours to be able to feed them to their livestock. This technique will now save them both water and firewood, and improve the health of their animals. ECHO staff and volunteers were honored to share the knowledge with the pastors, and were greatly encouraged to learn from them as well. Then, every afternoon they taught nearly 80 children from the children’s home! 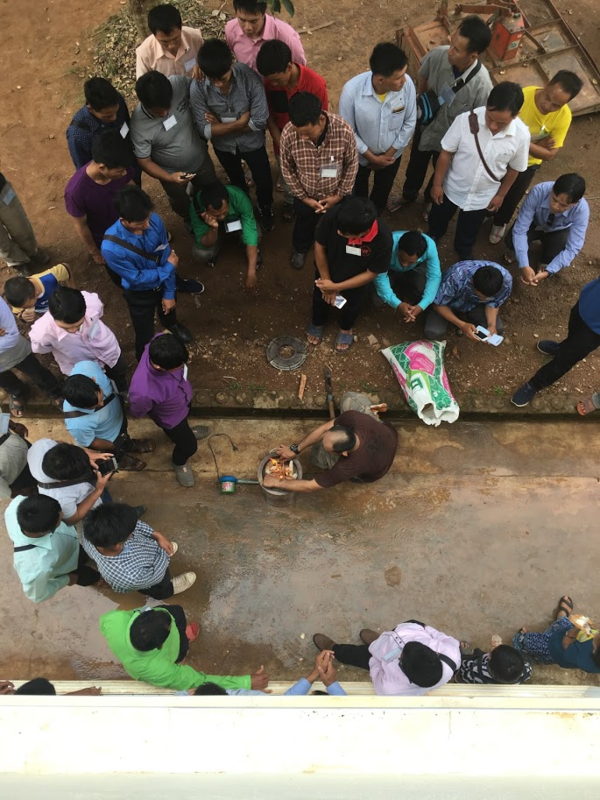 It was fun and rewarding as the Laotian pastors were extremely enthusiastic and were very involved and engaged. The children had loads of fun too, getting muddy and learning how to garden! Our local partner is already excited about next year’s training... and so are we!